Vegan Food Exists in Cuba....True or False? This is Cuban, just not traditional. These moringa noodles were served up at a restaurant in Vinales but aren't typical Cuban either. During the four group trips to Cuba I've led this year, every single person - vegans and carnivores alike - were surprised at how much Cuban food on the island differs from what they've had in the US. Background: I've made seven trips to Cuba in the past five years and have explored every province. I've been served spaghetti with mustard and white rice with cucumbers, and I lost nearly 15lbs during a 3-month hitchhiking road trip across the island in 2016. I was surprised to find soy yogurt while camping in Guantanamo. Unfortunately, it was the only item I could eat and I got sick from eating too much of the watery, sugary, government-issued soy. One night, a friend brought me two cucumbers and a can of condensed milk from the closet-sized street market 2 miles away, the only food source in that village. They were "the most vegan items" he could find. I skipped dinner that night. I was astounded to find a restaurant in the small, non-touristy city of Bayamo in Eastern Cuba that displayed the giant sign "RESTAURANT VEGETARIANO", above the entrance. I was less excited to find that half of the menu items in the vegetarian restaurant were regular meat dishes, they just also served more vegetarian sides and soups than most restaurants. I confirmed that the various vegetable soups were completely vegetarian, made with no meat, no chicken, no bones, and no meat broth. I happily ordered my first bowl of soup in 3 months and found a chicken bone in it. My server wasn't at all concerned. While this would be annoying and unacceptable in the United States, remember that there simply is no vegan - or even vegetarian - culture in Cuba so there's not an understanding of why people abstain from consuming animal products. They're not used to people asking for menu alterations and Cubans tend to be extremely easy going so it's not a big deal should they be served something a bit different from what they ordered. Finding vegan food in Cuba can be a challenge (unless you have my Vegan Survival Guide for Cuba) but don't be that person throwing a tantrum in the corner because they put ham on your sandwich then took it off and gave it right back to you. It will happen. Get over it and keep it moving. American tourism to Cuba is a relatively new thing; there's no reference point for vegan food and Cuban restaurateurs are doing their best. There's been enough drama between the two countries' governments and it's up to us to represent our country and be gracious guests on their island. Also, Cuba suffered through the Special Period, an extended period of economic crisis that began in 1989 after the collapse of the Soviet Union, Cuba's primary trading partner and source of food. Average body weight dropped due to lack of food and the idea of turning down any meal is still unheard of and even offensive to many Cubans. The fallout continues to impact Cuba, where it's difficult-to-impossible to find so-called "everyday items". On that note, check out these simple items you can/should pack when visiting Cuba! When VegNews Magazine asked me to write the Vegan Guide to Cuba in 2016, I accepted the challenge and did my best to offer vegans suggestions for what to eat during their holiday in Havana. I've since traveled to the island another four times and will be leading a vegan-friendly Cuba trips in 2019! I'm happy to report new vegetarian and vegan options are popping up but it's still no vegan paradise. If you're heading to Havana for a long weekend, you'll be fine with the tips below, but if you're heading to smaller towns, want to experience "the real Cuba", or will be staying an extended period, be sure to pack a lunchhbox (my favorite is linked below), read on, and arrive prepared! Decades of US-backed embargo, trade restrictions, and poor agricultural policy has left Cuba with very limited variety. "Everyday" American seasonings like black pepper and parsley are not nearly as common and can be difficult to find. Spicy and highly seasoned food is not part of Cuban culinary culture and hot sauce can be scarce so travelers who want more flavorful meals should pack hot sauce or their favorite seasoning mix to dress up their meals. Up to 80% of Cuba's food is imported but it's mostly rice and non-produce items, meaning that the limited variety of crops grown is all that's available, which is especially limited during winter months. Salads are typically shredded green cabbage with tomato and soybean oil. Sweet mango and creamy avocado are delicious in the summertime but are impossible to find November - May. Food shortages are a part of daily life in Cuba and I can't tell you how many restaurants I've visited that didn't bother to use menus because they only had one dish (usually some type of pork). For more on food shortages, bars with no beer, and typical Cuban street foods, check out my blog post Spaghetti with Mustard? Several easy-to-find Cuban side dishes are vegan-friendly, including plantains and yuca (fried, mashed, or boiled) or fluffy white rice that is sometimes tinted purple after being cooked with black beans (known as "moros y cristianos" or "congri"). It is sometimes cooked with pork so be sure to ask in advance. Common street food is limited to pork sandwiches, pre-fab pizza (which can't be made without cheese), and the infamous Cuban spaghetti. Note that any "Italian" restaurant is most likely a fast food pizza and spaghetti joint. The default spaghetti comes topped with cheese so be sure to specify "sin queso". It tastes like an overcooked and extra sweet can of Chef Boyardee but it will cost you less than $1 and can hold you over until you find a real meal. I usually top mine with the dry chili lemon spice mix that I carry with me. Brought my chili spice this time! "Casas particulares," are private homes and rooms that Cubans rent to tourists and can be identified by a small, blue, anchor-like symbol on or near the door. Sometimes the room is in the back of the family home and sometimes it's in a separate apartment down the street from the family home. The price and quality vary, and can run from $30 to $150/night, depending on the number of rooms and perks such as outdoor gardens, patios, and balconies. Casa owners are eager to earn extra money by offering meals to their guests. This is your best bet to find a good meal, vegan or otherwise. 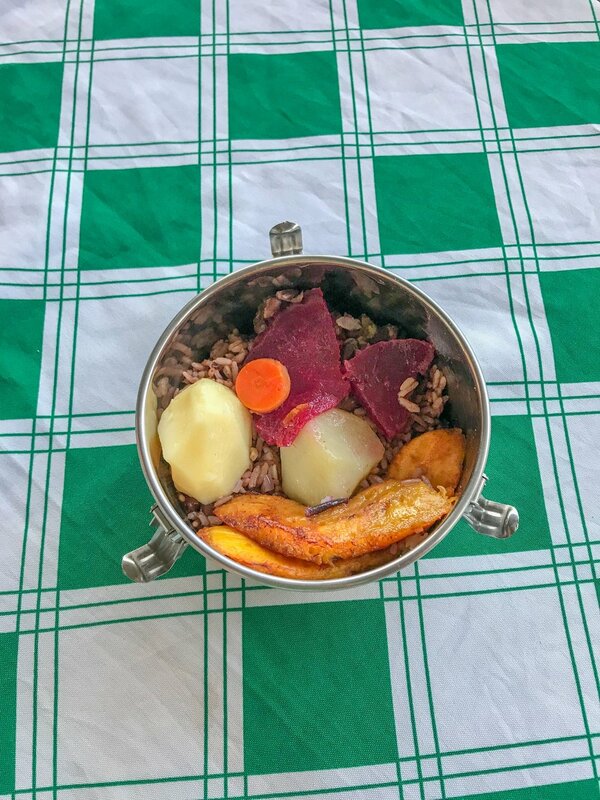 Rice and beans are standard and you can request items such as fried yucca with crispy garlic, steamed plantains with pan-fried onions, and sautéed cabbage and carrots. My personal favorite is squash, or calabaza, which can be sauteed with onions and garlic or can be stewed with the black beans. Bring a lunch box (like my favorite stainless steel container below) to pack up meals from the house to take with you in case you don't find food on the street. This lunchbox has been to Cuba with me 5 times! Though most Cubans are not accustomed to making meatless soups, they've been extremely popular with my group tours (even with the meat eaters!) so I always request a water-based soup full of whatever veggies the host can find at the market. Since market offerings are never guaranteed, I've been served creamy tomato and spaghetti soup, thick pumpkin and yuca soup, and mixed vegetable soup full of cabbage, potatoes, carrots, and beets. Remember that these soups are not traditionally Cuban and may be overlooked by even the most creative Cuban chef so you may have to spell out exactly what you do and don't want in the soup. Contact me if you'd like help finding trustworthy casas who know how to prepare good vegan food. AirBnB is a newly popular option for booking rooms in Cuba but I can't fully endorse it because the country isn't quite ready for it yet. Since well before AirBnB launched, Cubans have been booking tourist reservations, then bumping the tourists to other, and sometimes less desirable, homes in order to make room for a more lucrative booking. I've heard far too many horror stories from people who arrived at their Havana AirBnB only to find out that the address was wrong, they were taken to a completely different home, or they found themselves in an undesirable neighborhood. If you insist on going with AirBnB, it's easy to book and you can use my promo code to save $40, but I strongly advise you to contact me to help coordinate a stay with trusted casa owners that I have worked with for several years. Typical vegan option: Cuban "congri" (rice & beans cooked together) and cucumbers with soybean oil. Trying to spice up my spaghetti in 2015 with some boiled peppers. Not delicious. As of this writing, I'm not aware of any fully vegan restaurants that exist though there definitely are some spots that offer more plant-based cuisine. However, since businesses come and go and Yelp doesn't exist on the island, I recommend that travelers be prepared to rely more on casa meals than on restaurant meals, particularly outside Havana. Several vegan-friendly restaurants and a fully vegetarian restaurant are included in my vegan Cuba survival guide. Get my 2019 vegan survival guide to Cuba, which includes travel tips, a language & translation guide, packing tips, and a list of vegan-friendly restaurants and a description of the best items to order! One-stop shop supermarkets don’t exist in Cuba and markets that do exist, are far from super. Instead of fully stocked supermarkets, locals rely on a slew of smaller stores but many of the shelves are bare and the selection is sporadic and unreliable. Cuba’s quasi supermarkets don’t sell fruits or vegetables but junk food is readily available. Vegan staples such as peanut butter and pasta sauce that are easy to find in other countries, are hard to come by in Cuba. Relatively easy-to-find vegan items include: spaghetti, unseasoned tomato sauce, white rice, and bags of dried beans (black, pink, and if you’re lucky, garbanzo). Olive oil is available but soybean oil is far more common. A few dried spices can also be found but if you plan to cook a lot during your trip, consider packing your favorite dried spice mix. For actual vegetables, head to a produce market (ask your host for help finding one), or even to one of Cuba’s many produce carts. Most markets and carts sell basics like bananas, papaya (known as fruta bomba in Cuba), guava, plantains, yucca, onions, garlic, and tomatoes. Better stocked shops and carts may also have green beans, cabbage, spinach (likely wilted), and one of a couple types of orange squashes found in Cuba. The variety of fresh produce found in Cuba is extremely limited and markets run out early so be sure to shop in the morning. Many produce markets (and even some street carts!) also sell bags of black and red beans, making one-stop shopping a bit easier. Like many vegans, I pack a big bag of mixed nuts and Lara bars before a trip somewhere that isn't vegan-friendly. This is especially important in Cuba because a basic vegan staple like nuts can be hard to find. Sure, you can find street vendors selling white paper tubes of peanuts for one peso, but you're not going to find pecans, almonds, walnuts, or any type of trail mix. I've traveled through every province on the island and the only place I've seen almonds were in rural villages in Guantanamo. Locals collected almonds from wild trees, packed them into old coffee bags, sewed them shut with thread, and sold them on the road to the few tourists passing through. If you're going to be spending an extended amount of time in Cuba, you won't be able to pack sufficient food in your luggage to last your whole trip but nuts, bars, and protein powder can help hold you over while you get comfortable with the cuisine. Also, if you can spare any extra room in your luggage, consider bringing some small but desperately needed donations.